« The home is the most obvious and personal of ethnic traits » , says Leroi-Gourhan, ethnologist. It is in fact considered one of the last markers of regional identity, even to the point of excess when that identity becomes a bit less clear. 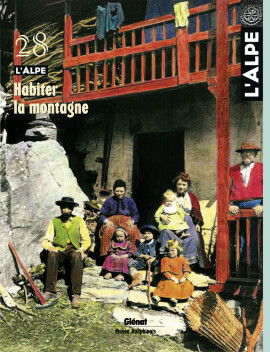 The originality and diversity of Alpine buildings is the product of a mysterious mixture, three drops of culture, a touch of nature and a dash of common sense, all wrapped up with a bit of imagination and artistry… Rural architecture presents, from one end of the Alps to the other, a fabulous palette of shapes, techniques and materials. Alpine roofs offer a wide array of colours, materials and angles that contribute to the harmony of landscapes in inhabited mountain areas. These discreet elements, designed and built with pride by generations of craftsmen, are slowly disappearing. A call for recognition of an abandoned heritage. Caves sheltered shepherds and their activities on the southern faces of the central Alps. Hundreds of barns, stables, storage areas and other temporary lodging, very rustic but highly practical, bear witness to clever adaptation to the environment. A most original form of Alpine architecture. Travelling masons, the men from the small valley of the Lys, a part of the Aoste valley, set off each year to build in other parts of the Alps. In doing so, they exported the architectural styles of their own villages to regions as far away as the Savoy and the Valais. Their buildings, from a far off land, now integrated in the local traditions, remind us of the long European tradition of exchanging techniques and know-how. Two hundred trees for a single house ! An impressive figure, produced by a recent study on a traditional home, three centuries old, is a small Valdotain valley. At that time, such « raccard » homes were built by the dozens and the forest seemed limitless. A round porcelain stove heats the cozy, wood-panelled living room. The Stube is the German version of the « warm room » in mountain homes. The centre of family and social life, this finely decorated, welcoming room is a centuries-old tradition from medieval times. Roberto Neumiller has for years travelled the Alps to photograph the inhabitants. The intriguing comparison between his photos and those taken a century earlier and drawn from the archives of the Musée dauphinois in Grenoble reveal troubling parallels. These tiny buildings, modular and removable, formerly contained reserves for the winter months, the family’s precious possessions and… high symbolic value. Today, transformed and now called « mazots », these wooden granges contribute to the myth of an ideal mountain culture. « Old-style » chalets and geraniums have invaded the Alps. A windfall for builders always ready to please. But in the process of returning to « tradition », the neo-rustic imitations are stifling contemporary architectural design. A protest. Worn by time, repainted and repaired a thousand times, decorated solely by their rustic iron or wooden fixtures and latches, doors and shutters are true works of art for those with an eye. Observe the many discoveries of Catherine Stahly-Mougin in Volvent, a small village with twenty inhabitants, located at an altitude of 850 metres in the southern French Alps (Drôme). The Musée dauphinois in Grenoble has devoted a major exhibition to Louis Mandrin, who was also active in the flourishing contraband business in the middle of the 1700s. This is attested by a recent, in-depth study of the archives of the Savoy senate. At the end of the 1800s, Victor de Cessole, a nobleman, scientist and alpinist, discovered the tortured landscapes of the upper Var valley. For over forty years, he walked, mapped and photographed the mountainous hinterland of Nice. And in the process, he succeeded a number of significant climbs, including the Aiguilles de Pelens . One hundred years ago, on 16 August 1905, four men made it to the top of the Grande Aiguille de Pelens , after a number of delicate manoeuvres on the extremely unstable rock. A victory for Victor de Cessole and his guides on what is considered to this day a most dangerous mountain. The results of the poll carried out among our readers, in issue 26 last winter.